@ romulous: v1.1.19.01 fixed the bug. "v1.1.18.00 (temporarily reverted from v1.1.19.00, pending a bug fix)"
So it is back to 1.1.18.00 for the moment. Just to add to my above comment, it also mentions the situation on the ahkscript.org front page, under the 'Why ahkscript.org?' heading. @Special: Seems so. http://ahkscript.org/foundation/ and http://ahkscript.org/foundation/history.html makes for some interesting reading. "stealth: ? No. Places an ahk script file in user documents by default"
And if you put a file there(appdir) called "autohotkey.ahk" it will launch that one (even emty). Also it shouldn't be launched directly you schould have passed a script to it. @BillDixon : I use the portable version under Win7 and it works fine! Start it with administrator rights. What about Windows 7? The version on this page doesn't list it (and it doesn't work, I tried). The AutoHotkey website lists Win7, but it's for an installed version. Does anyone know if that version can be installed/copied/uninstalled? It is a very good program, really useful indeed. However, one must not be newbie nor lame to use scripts or even create them, as this program is not for people that know nothing about programming, in my opinion, of course. I forgot that there is also a WindowsCE/PocketPC version now. 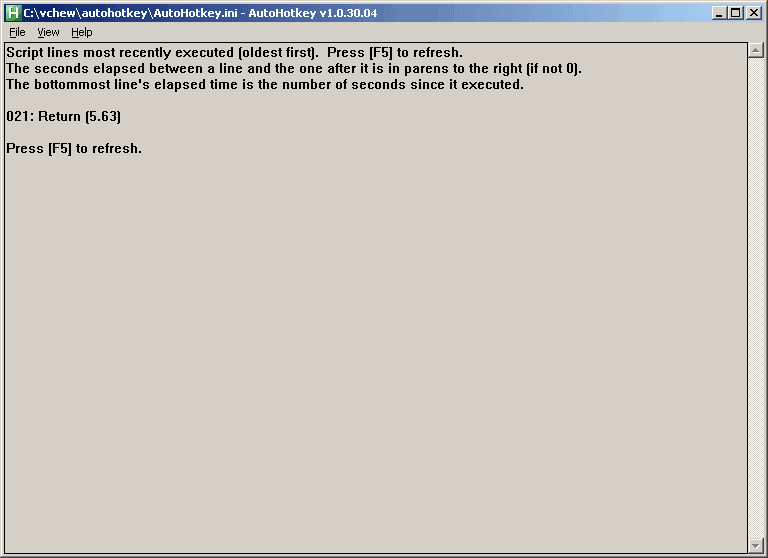 I depend on AutoHotKey every minute of my working day. It's the best macro program available and has greatly increased my productivity. It took a while to learn how to use all of its powerful features, but it was time well spent. "How to extract: Download the ZIP package and extract to a folder of your choice. Launch AutoHotkey.exe." This is not entirely correct. this app belongs with autoit in the Programming - Scripting Languages. i use both autoit and autohotkey each has it's advantages/disadvantages, but 90+% you can do in one you can do in the other. AutoHotkey is great for providing applications with missing or extra functionality. For example, I've turned my launcher icons into launcher "buttons": the first press launches the application, another press makes it active if it isn't, and if it is active, another press closes it, however I want. Also, linking to an AutoHotkey script or executable rather than directly to a program can overcome some relative path issues (like for working directory) that some launchers have, since AutoHotkey can handle relative paths. Awesome! Taking a two hour lunch instead of no lunch since this replaces so many timely tasks. I have easily automated the following monthly task for a series of Excel reports. Update reports, remove SQL links, rename, save, compress with unique passwords, delete renamed files, place all zipped reports into one zip file, open Firefox, login into our website, upload zipped files (site automatically unzips the master file and overwrites old copies), logs off the website, removes all temp zip files and more. This is all done with two clicks of the left mouse button. Thank you Autohotkey for getting me home to my family early while this lengthy task completes unattended. Simply Awesome!!!!!!!! This application made my computer very unstable until I uninstalled it. Hopefully it works for you, but you might want to keep that in the back of your mind in case things get unstable. lol, i agree. i barely scratch the surface and i do not in any way have any scripting language but this got me hooked. theres just so much amazing things you can do with it. okay, i have to admit, this program is pretty amazing. I'm not sure why i'm suddenly passionate about scripting in it as opposed to just writing win32 code but dang is it addictive. cafe one of my other favorite portable apps turned out to just be a compiled ahk script. Now i see the possibilities. Have a look to the script collection http://www.heise.de/ct/activaid. Easy to use (but German homepage; English texts available within the application...). How does this compare to auto-it? pretty impressive scripting language support. I'm probably going to stick with swizztool tho which has the same functionality but not nearly as advanced. swizz is not open source tho. open source good. you can edit this ini file like a ahk file. Windows has this option natively. Just go to your start menu, left click any shortcut and go to properties, on the "shortcut key" set the combination that you like and click ok. You're ready to go. You can set combinations with ctrl+alt, ctrl+shift and ctrl+alt+shift and a letter or number. If you move or delete the shortcut without clearing the shortcut key you'll have to reset your computer.